Born on July 4, 2009, Beethoven's Dorian will grab your attention like a fireworks show. 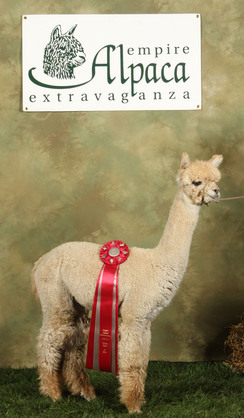 He is a handsomely balanced light brown male with excellent fleece characteristics and an impressive show record. Dorian has conquered all to bring home not ONE, or TWO, but THREE Judge's choice awards, his most recent being at the Empire Extravaganza 2011! Dorian has also won 11 Color Championships along with Futurity Reserve Championship. 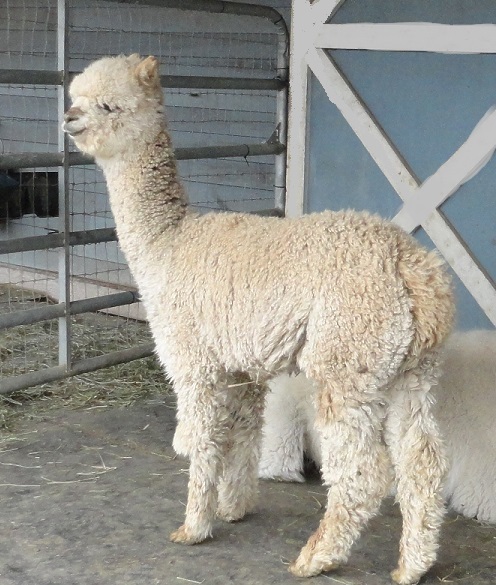 Dazzle is a beautiful daughter of 8X Champion, AML El Duro's PRINCIPIO, her other notables include PPPeruvian Kenamori Gold, Royal Fawn, and granddam Miss Clarice. 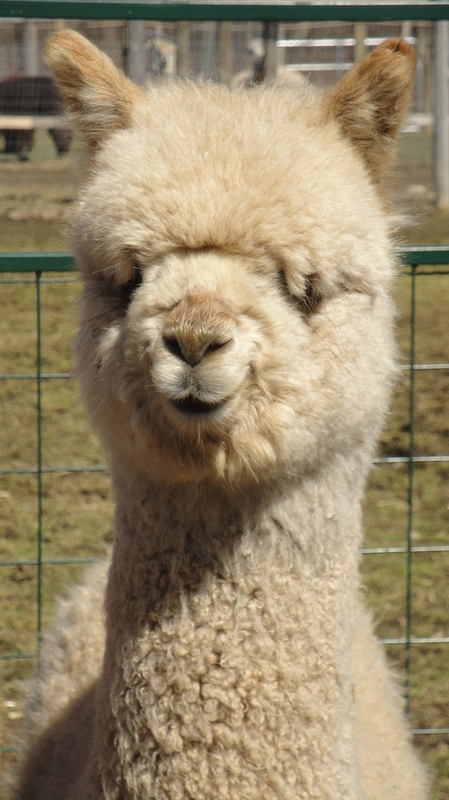 She has wonderful fiber statistics, featuring a 15 micron, and her dam is one of our foundation girls. She has been a wonderful producer and mother. Her first cria has done very well at the shows and always wins the judge's unofficial cuteness award. Gabriella has a powerhouse of amazing pre-potent genetics from both her sire and dam. A daughter of Beethoven’s Dorian, she is one of the few Dorian offspring, of breeding age, available for sale. Just as her grand-sire's on both sides, NM Beethoven and AML El Duro's Principio she carries an abundance of soft, bright well defined crimp architecture over a strong, correct frame - typey look and excellent conformation. 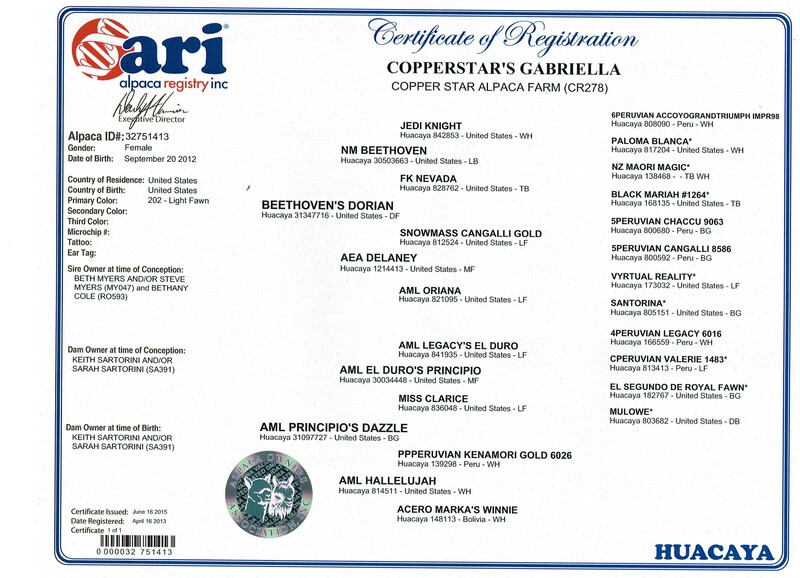 Added to this is Gabriella's sweet disposition, she will turn heads as her sire has. Gabriella's first breeding is to our Multi Champion Crystal K-O. K-O has produced show winning offspring and we are expecting another K-O knockout. Take advantage of this opportunity to add these genetics to your herd. Gabby delivers a beautiful male, sired by our late AML El Duro's Magnum. With the passing of Magnum this past summer (2017) we are fortunate to have the last two offspring from this magnificient 15X champion, one male and one female, both resembling their sire. We are looking forward to watching these two beauties grow. Gabby delivers a beautiful female, sired by our multi champion Crystal K-O. 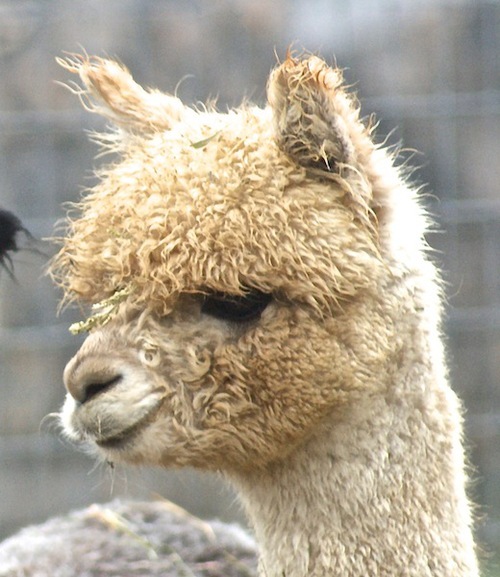 This cria is sheer perfection. Exceptional mom! 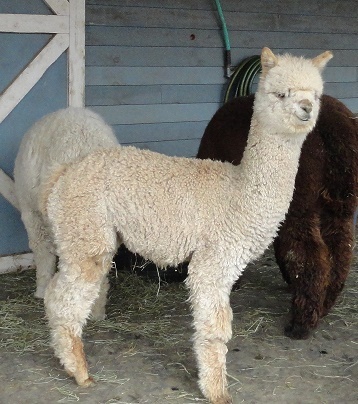 Gabby's 2nd cria, is a stunning LF male, sired by the late AML El Duro's Magnum (the last male offspring of Magnum).